A new cook is born with a hand-me-down Kitchen Aide and a few ingredients. My eldest daughter, is not only dedicating her life to her new family, she has resigned as our self-appointed cook. This meant that my husband and I starve, or I consider moving back into my kitchen. I literally had become a guest and only showed up there for meals! As with the dusty piano tuning pegs featured in a picture in last week's blog, I needed to literally "dust off" some old cooking skills, too long unused and forgotten and learn some new ones in order to take back this less-than-favorite role of being the cook at Little House! Having been on special diets most of my life, my shelves of recipe books have largely gone unused, except for browsing through them while drooling on their pages. I love to eat, but for many years, having to substitute ingredients makes cooking a serious mental activity. Substituting was only part of the challenge, eliminating ingredients like milk, wheat, eggs, sugar and vitamin D was yet another one. Label reading made even my simple three or four ingredient recipes a serious study, and it was just easier to find more suitable recipes!! Somehow cheesecake just isn't the same without eggs and cheese!! I have, however managed through the years to make bread without milk and eggs, and cookies without flour as well as reduce the toxic, but delicious, sugar! Baking always did come first! Having inherited my daughter's Kitchen Aide for Christmas, I was already enjoying spurts of baking homemade gluten-free cookies. 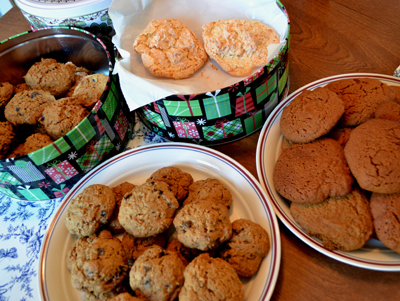 I progressed to making some of my family's favorite cookies to surprise them at Easter, and before long I was taking back my kitchen without my daughter to re-season my pots! I recollected how years ago, I used to put up various meals in the freezer on the weekends planning ahead for when I would come home from work too tired to cook. Now I like to take late afternoon naps, and figured I could revert back to some of my old ways of cooking and appear like Martha Stewart, having a delicious hot meal each evening while being well-rested and getting my stitching done too! What is not to love about garden produce? 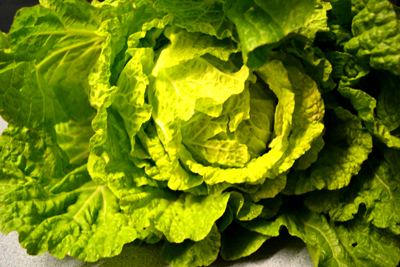 Home-grown Napa Cabbage makes a great slaw!! Learning from my daughter and her friends, I actually started making meals by adopting one of her friend's methods of meal planning. She uses her cookbook in a straight forward way by simply starting from the beginning and fixing each recipe. She would have seasons dedicated to nothing but salads, soups, desserts etc. I would simply start with casseroles! I figured an afternoon of putting up several casseroles divided into smaller ones for just my husband and I, would keep us stocked for a month or more. I always did like one-dish meals, and simply pulling one from the freezer and heating sounded easy enough. Instead of cookbooks, I got recipes right off line or on Pinterest by simply doing an internet search for gluten-free casserole recipes. No substituting or eliminating ingredients would be needed! I tried making a gluten-free lasagna, but somehow the rice noodles simply turned to starch paste when frozen. I then tried a noodle free lasagna and simply boiled rice noodles to serve with these "sauce casseroles". Still better I found excellent gluten-free Tatertot casserole recipes and made all sorts of varieties: buffalo chicken, shepard's pie, chicken pot pie, and let me miss an ingredient or two and I started creating recipes of my own! While my husband is "easy" to cook for, he doesn't like to eat the same thing twice in a row and so I soon expanded my repertoire and came up with "in-between-casserole meals" of hot dogs and baked beans (right out of a can), hamburgers with, dare I say it, "Tatertots" and cottage cheese with sliced tomatoes on the side. Bagged salads were easy too! Pre-made frozen stuffed shells with spaghetti sauce right out of a jar followed and was another hit for my husband while I ate instant one-serving-sized gluten-free mac and cheese. 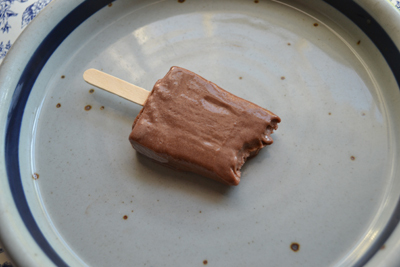 Desserts were easier yet, an old-fashioned "Milk-Nickel" ice cream bar on a stick or variations thereof. This made us both "stick" to a normal sized serving (pun intended) It made me wonder if perhaps meals could be served on sticks? A new form of diet that we could "stick to"? OK, now I will give up the puns!! But perhaps a great and easy invention in the future, after all my sister has gone to only using paper-ware so she doesn't have to do any dishes. The possibilities are so vast! Variations on a desert theme...all individual serving sized on a stick! We aren't starving and my confidence is building! Though I hate to admit it, my daughter and her friend's influence came shining through. With summer approaching I turned to grilling, or to be more accurate, I recruited my husband to do the grilling. I simply marinate the chicken by pouring a little Italian salad dressing on it while it defrosts in its freezer bag (frozen, pre-filleted and and ready to go). When slipped onto a grill for a few minutes on both sides, it is delicious! So as to not appear totally lazy, I do my part of the meal by pouring out pre-cleaned and -cut fresh veggies along with a sliced onion on a cookie sheet, sprinkle them with olive oil and garlic salt and pop them in the oven to bake for about 20 minutes or so, giving them a stir, and voila another favorite addition to any meal! BBQ'd hamburgers can also done at the last minute. With cottage cheese, canned baked beans, and bagged salad on the side, or sliced fresh cucumbers and add any left overs and we have our own smorgasbord! 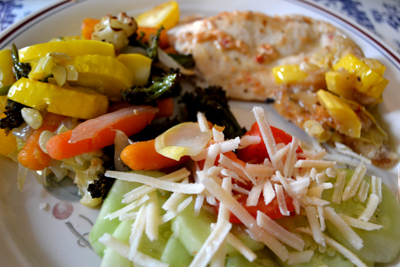 Variations of squash and cucumber dishes...all easy to prepare...Delicious, no? 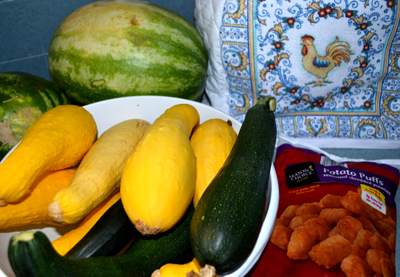 Zuchinni and Yellow Squash Season came next. A relative told me about her favorite recipe: sliced squash with browned hamburger. 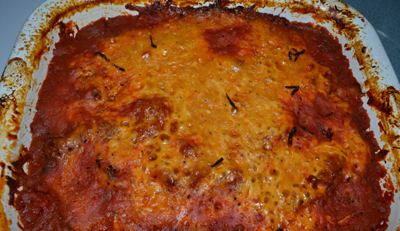 sauteed onion, covered with spaghetti sauce and topped with mozzarella cheese. It is delicious! I also made a squash dish by adding spiced Mexican-style corn and sauteed onions served with a nice sharp Parmesan cheese sprinkled on top. Miraculously, some of my meals are actually looking like healthy eating??!! My mother's labor intensive Martin Potato Salad. There you have it, another big change at Little House!! I am turning back into a cook, and have gotten brave enough that I even attempted to make my mother's Martin Potato Salad. 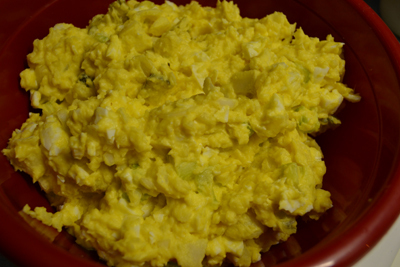 This is no ordinary potato salad but a yellow mustard sort complete with eggs. My mother and her sisters grew up on it! I would fix it more often but I am the one that is most faithful to sticking with it until it is gone and I only know how to make it in "big family-reunion-sized quantities! I was proud enough of my accomplishment that I took a picture of it! My daughter was quick to tell me that I needed to work on my photography skills. Little does she know that it IS a good picture! It really did turn out to be more of a mashed potato salad, but she missed the point. I actually took the time and effort to make this involved and labor intensive dish! What a cooking accomplishment for me, mushy or not!! A squash, hamburger, onion, spagetti sauce and cheese, perfectly "blackened". I am now thinking myself an accomplished cook that should produce a Quilter's Easy Meal Cookbook, though I think such cookbooks already exist? Perhaps, better yet, a Fix-it, Put-it-in-the-Oven-and-Take-a-Nap Recipe Book might be more suitable for me and my friends, though that one still needs some work on the temperature settings to avoid blackened dishes, though perhaps this will become my new specialty? 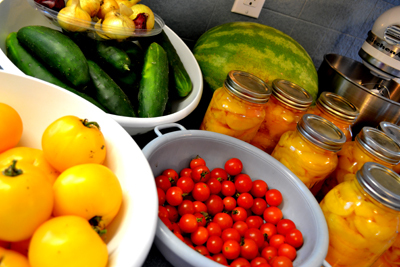 Right now I am simply looking forward to Bread Season, and Cookie and Cake Season, though I think we have the Pickle and Canning Season before? Pickles and jam for dinner...really? When is the Eating Out Season I wonder? Labels: a less-than-fine-art-of-cooking menu; meal ideas for busyquilters; Don't-try this-at-home Recipes.